Verdict: “The Romance of the Three Kingdoms” have been adapted in many different ways. Some were poorly done, some were good. Unfortunately, this one’s below my expectation. Although it’s only an adaptation of a chapter or two in the whole of the “Three Kingdoms” classic, they shouldn’t have messed around with the original. 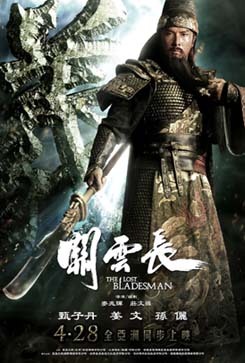 Especially when the main focus is Guan Yu, as everyone knows, is a godly figure and to have interpreted him as how he is in this film is quite pathetic. Donnie Yen could’ve been a great Guan Yu, but was wasted on poor script. The action scenes are alright but nothing spectacular. Perhaps the only element I was impressed with was their version of Cao Cao, a character in the original which was usually portrayed as a villain. Jiang Wen was perfect for the role. A scene that would’ve mattered: In one of the chapters of “The Romance of The Three Kingdoms”, Guan Yu’s arm gets injured and has to go through a painful surgery without being sedated. I’m surprised that they didn’t include this significant part into the film. Gayness: Watch the trailer above and wait the post-title cut scene at the end. It doesn’t sound anything like that in Cantonese though. i prefer the one in mandirin.. cantonese sound like very weird for me..